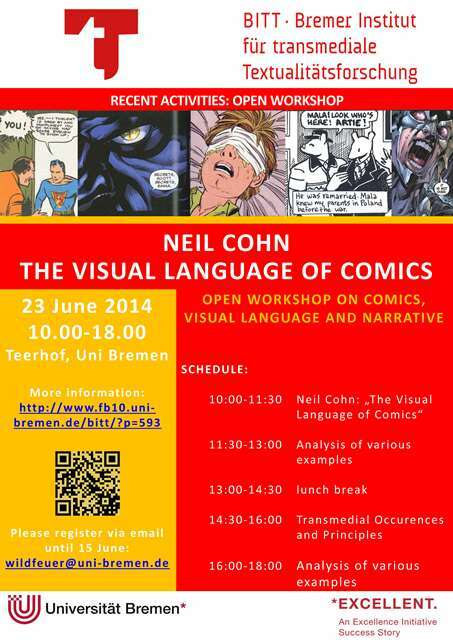 The Visual Linguist: June workshops in Germany! The first will be at the University of Freiburg throughout the day on Saturday, June 21st. I was invited to do this event by Stephan Packard, and it will be sponsored by the Institute for Media Culture Studies. This workshop will be a compact and content filled introduction to my theories of visual language. I'll cover the basic ideas of this broad architecture, how it connects to other aspects of cognition, and how it can be used in practical analysis of comics and other phenomena. I'll be posting more information about this workshop in the coming weeks as we hammer out a few of the details and a website goes online for it. All are welcome to attend! Finally, my most extensive stop will be at the University of Bremen, where I'll kick things off on June 23rd with another open workshop stretching throughout the whole day! (English, German) I was kindly invited here by John Bateman and Janina Wildfeuer for this event hosted by the Bremen Institute for Transmedial Textuality Research. This workshop will again cover the basics of visual language theory, and will involve hands on discussion of how these principles operate throughout different comics and graphic communication. As with my workshop in Freiburg, people are welcome to attend from all over. So, if you're in Germany, the Netherlands, Belgium or any other place nearby and want to learn about visual language theory, please come out for the workshop! Additional information about the workshop and registration can be found at this website. Then, on June 25th I'll give an additional talk at the Bremen University lecture series on "Recent Paradigms of Film Studies" (English, German). This talk will provide an overview my theory of "narrative grammar," what the research on behavior and the brain can tell us about comprehending sequential images, and how these structures apply beyond static visual sequences like those in comics, but also to film, and verbal discourse. I am very excited about these upcoming events, and to have the opportunity to share my work with so many diverse people. I'll be posting reminders and more information as the dates get closer, but if you're interested, please come to the workshops!